We’ve made some updates to make it easier to track commission import events and purge imported commission statements. Also, a couple of updates to allow file deletion and association removal. Finally, a minor update to allow third-party lead posts to bring in county data. We replaced the ‘Commission Import History’ tab with a new ‘Commission Import Audit’ tab on the Commission Import Carrier Data page. The new tab features a Commission Audit Log that lists import, merge, purge, lock, and unlock events. You can use the log to track which users did what when, and purge commission statements by import. In the past, if you had imported two or more commission statements on the same statement date, you couldn’t pick and choose which ones you wanted to purge. You had to purge all of them by statement date, then re-upload the ones you wanted to keep. Now, you can select and purge only the statement(s) with issues and keep the others. To purge an uploaded commission statement, access the Commission Audit Log and select the ‘Purge’ button next to the corresponding import event. Please note, the ‘Purge’ button will only appear for import events from the November 2017 release onwards. For commission statements that were uploaded prior, you will need to purge them by statement date from the ‘Manage Dates’ option on the main Commissions menu. With this update, you can now delete uploaded Carrier Product Files, Carrier Form Files, and Agent Detail Information Files. To delete an uploaded file, select the pencil icon in the file box. Then, select the ‘Delete’ option. 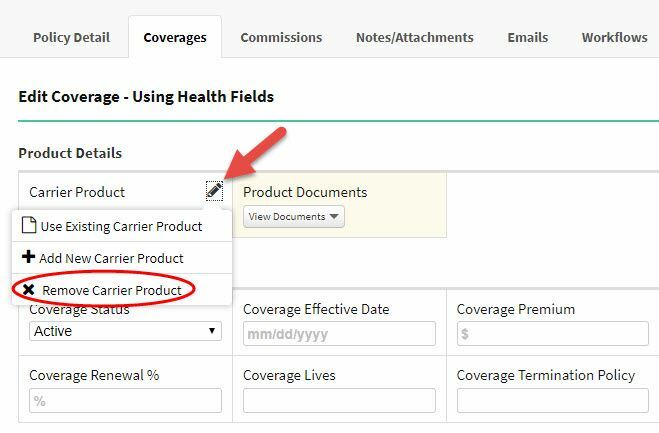 With this update, you can now disassociate the Carrier Product from a Policy. Please note, this will not delete the Carrier Product. To disassociate a Carrier Product, select the pencil icon in the file box. Then, select the ‘Remove Carrier Product’ option. We updated our API so your third-party lead posts can bring county data, as well as address data, directly into AgencyBloc.